I have the perfect homemade hamburger patties recipe that you and your family will love. It's simple to make and produces the juiciest hamburger patty. I also offer you my homemade hamburger seasoning mix that makes patties (and burgers) taste amazing. This seasoning is an excellent accompaniment to my hamburger patties recipe. Enjoy. Mix well and store in an airtight container in a cool, dry place. When you go to the supermarket to buy ground beef, they offer you three choices. Ground chuck, ground sirloin and ground round. Ground round is too lean to make a perfect burger so I am going to talk about the other two. Ground chuck has the most fat and produces a juicy burger. Ground sirloin has the best flavor. What I do is combine the two for the best of both worlds; a perfect hamburger. Get out a bowl and break the ground beef into pieces. HANDLE CAREFULLY. Working the ground beef too much will result in tough burgers and you do not want that. Add 1 to 2 teaspoons of hamburger seasoning per pound (the recipe is above), and toss lightly to combine. 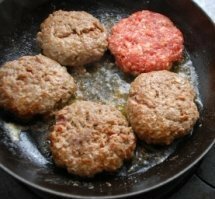 Divide the ground beef into equal sized portions and form gently into 1" to 2" patties. Press the center of the burger with both thumbs to make an indentation because burgers tend to "puff up" when cooking. The first "secret" to perfect burgers is searing the outside of the burger. This locks in the juice so it doesn't dry out. Make certain that the grill or the skillet is hot. When both sides are seared, you may move the hamburgers to the outside of the grill or lower the temperature on the stove. The second "secret" to perfect burgers is not turning them several times. Many people think that cooking hamburgers is the same as steak, but it is not. Ground beef has bacteria, so you want to cook it as well-done as you can muster. Medium is healthier and still produces a juicy and tasty burger. Steak only has two sides for bacteria to harbor, so cooking it rare or medium-rare kills the bacteria on the surface of the steak. The third "secret" to perfect burgers is how to gauge when they are ready to flip. When you place a burger on the grill or in a skillet, look for blood to come to the surface and then turn them over. Blood will come to the surface again and when it does, it's cooked to medium. The final "secret" to a perfect burger is simply DO NOT PRESS DOWN on the burger when cooking. This literally pushes all of the juice out of the burger and is a huge "No-No."